Jerusalem - Two Israelis were killed and at least 41 others injured when a public bus overturned on a highway near Jerusalem. The bus collided with a car on Route 443 as it traveled from Modi’in to Jerusalem on Sunday morning. The accident occurred outside of the Beit Horon settlement. The bus collided with another vehicle on the rain-slicked road and then hit a guardrail, causing it to fall on its side, according to reports. Two of the injured are reported to be in serious condition. The victims killed have been identified as residents of the haredi city of Modiin Illit in southwestern Samaria. Three of the passengers were trapped under the wreckage of the bus. A crane was brought in to right the bus and allow rescue workers to reach them. The cause of the crash has not yet been determined. 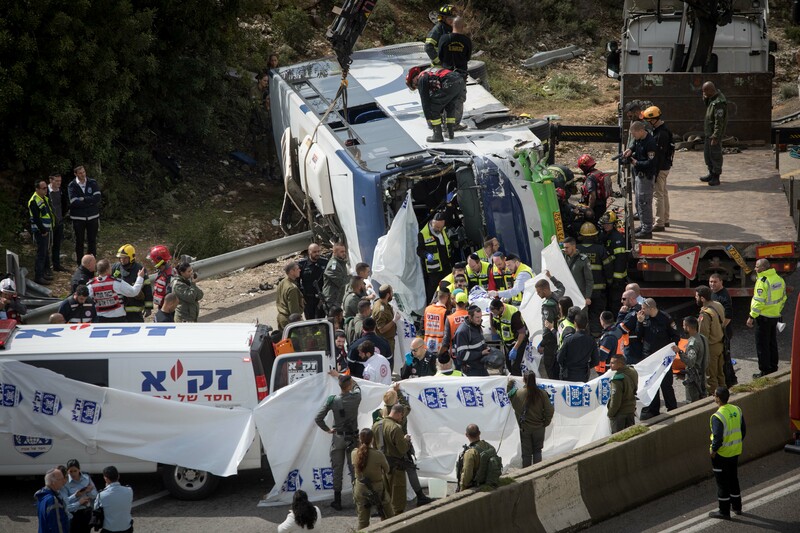 The bus driver was questioned after the accident, according to Hebrew media reports. “It all happened so fast,” one passenger, Noah Alfinbin recalled to Walla! News. “In 10 seconds we were overturned and suddenly we were all on the floor. I tried to help as much as I could after I exited [the vehicle]. I saw children and babies [everywhere]. 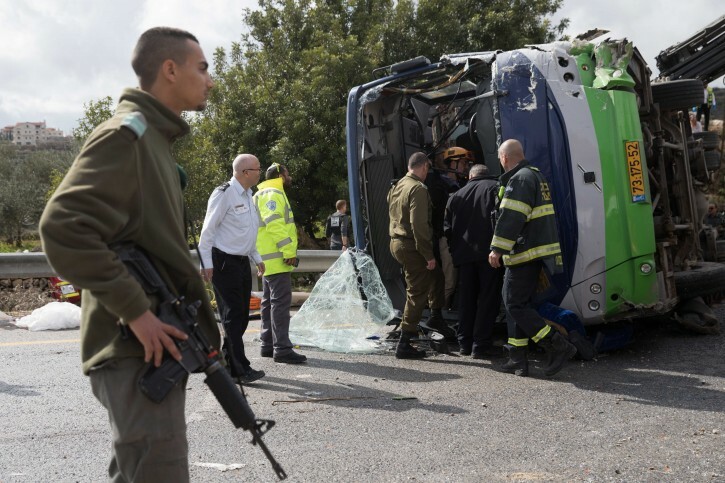 “Unfortunately, this morning at 09:15, Kavim line 304, which runs from Modi’in Illit to Jerusalem via Route 443, was involved in a serious road accident near Beit Horon,” the company said in a statement. A photo posted on social media showed a rescue worker carrying an infant from the scene, pictured feet from the overturned vehicle. Paramedics said four children were among those injured, including the infant. “I saw a woman in her 30s with a facial injury holding a baby and three little girls,” MDA paramedic Kobi Goldstein explained. “I took the baby, who was injured in the head, and calmed the group down, put the girls in one of our ambulances while giving them first aid. 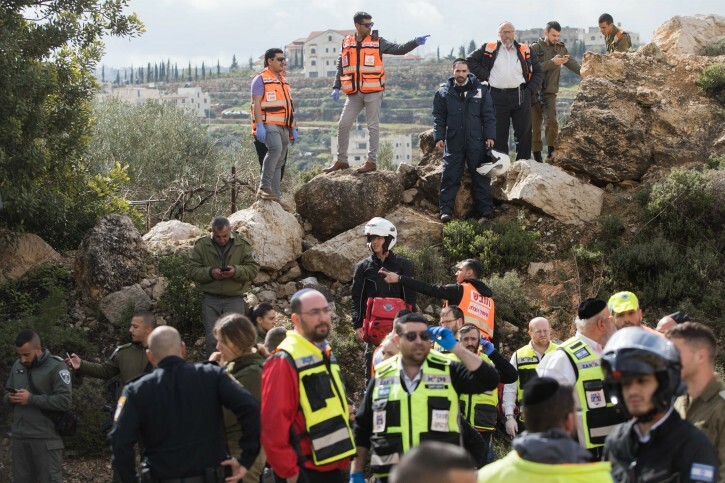 Prime Minister Benjamin Netanyahu said at the start of the weekly cabinet meeting that he had been briefed on the incident and that everyone was praying for the recovery of those injured. Deputy Health Minister Yaakov Litzman visited the scene of the crash. The Charedi community asked the world to join them in prayer for those injured in the bus accident. Reckless Israeli bus driver, was undoubtedly speeding on a rain slicked highway. Whereas it is difficult to get a driver's license in Israel, there is very poor and substandard enforcement of driving laws in Israel, especially driver courtesy and safety. The government of Israel has done very little to improve safety on its highways. To #2: Why, Lebidik Yankel-The truth hurts???? Till I hear otherwise, I must assume that some accidents happen because conditions degrade and there is risk. I have never been at the controls of a bus but I have read that there is always more risk of accidents and overturning, the miracle is it happens infrequently. I am really bothered by the attitude of the young men appearing to be dressed like frum Yeshivah men.The video was posted elsewhere. They are seen exiting and cheering themselves without understanding the gravity of thesituation and they are in the vicinity of people leaving this olam. To #4- Yes, you are right; when it is raining, it is incumbent upon all drivers to slow down, since the traction by the tires on the road is diminished. The dangers of Bus risks are more complex than diminished traction. The simple laws of physics apply greatly due to the greater mass and cetrifical force on curves.And diminished traction. To #6- Thank you for your physics lecture; you've reinforced my prior point, which stated that in lieu of your scholarly research, it is mandatory for these reckless Israeli bus drivers to slow down on rain slicked roads, and dangerous curves. It is common sense, which many of these macho fools are lacking. Unfortunately, the government of Israel in seventy years has never prioritized highway safety, or better law enforcement on the highways, vis-a-vis speeding, and reckless drivers.